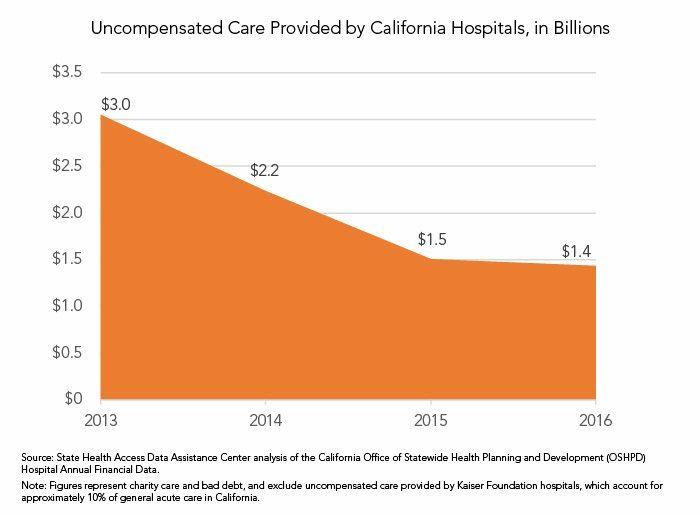 In California hospitals, the cost of uncompensated care continued to fall in 2016, but at a slower rate than the 51% decline between 2013 and 2015. According to data from the California Office of Statewide Health Planning and Development, the cost of uncompensated care dropped to $1.44 billion from $1.5 billion between 2015 and 2016 — a decline of roughly 4%. As shown in the following graphic, this relatively small decline follows historic reductions in uncompensated care under the Affordable Care Act (ACA). Uncompensated care is customarily defined as the combination of charity care and bad debt. Charity care refers to costs for patients with a demonstrated inability to pay. Bad debt includes unreimbursed costs that the hospital incurs for patients who were considered financially able to pay, or for whom the ability to pay was never determined. It is not surprising to see that uncompensated care has leveled off in light of the fact that California’s rate of uninsured has also plateaued. 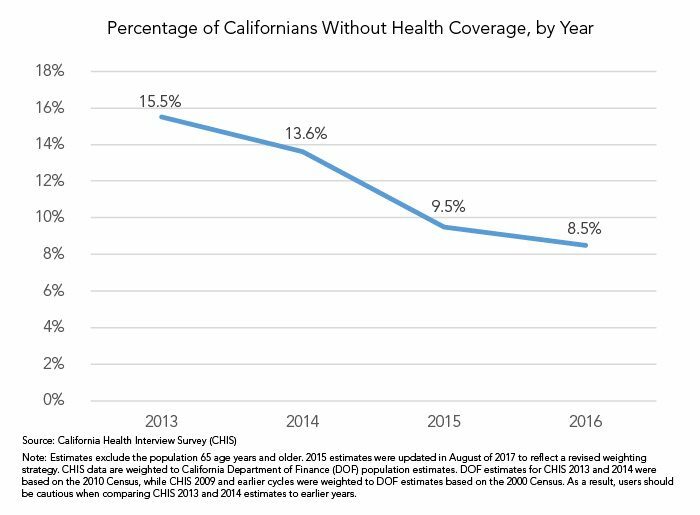 After an initial decline of nearly six percentage points between 2013 and 2015, the share of Californians under age 65 without health insurance landed at 8.5% in 2016. From a statistical perspective, the difference between that rate and the 9.5% in 2015 is not significant. Despite the slower improvement in the uninsured rate and uncompensated care costs, overall declines in both measures reflect major progress under the ACA. Expanded enrollment in Medi-Cal, California’s Medicaid program, has contributed significantly to both outcomes, and California is not alone. A recent study by researchers at the Kellogg School of Management at Northwestern University estimated that uncompensated care costs in all states that expanded Medicaid dropped by $6.2 billion between 2013 and 2015 — an impressive 41% reduction. As reported last year, data on the cost of uncompensated care have limitations. For example, the data from the Office of Statewide Health Planning and Development do not include uncompensated care provided by Kaiser Foundation Health Plan and Hospitals, which account for roughly 10% of general acute hospital care in California. In addition, public program payments (such as Medi-Cal and Medicare) do not always cover the full costs of providing care, and uncompensated care measures do not reflect these shortfalls. Policy changes that increase the uninsured population in California will increase the uncompensated care burden on hospitals. It is widely predicted that the recently passed federal tax overhaul, which as of 2019 eliminates fines for Americans without insurance, will result in an increase in the number of uninsured. This will likely result in increased uncompensated care costs for hospitals. Many state-based policies are currently under consideration by California lawmakers that could cover more of the state’s remaining uninsured. Such policies could help continue to reduce the state’s uncompensated care burden. Lacey Hartman is a senior research fellow at the State Health Access Data Assistance Center (SHADAC), where she leads a range of projects aimed at helping states use data to inform policy. Lacey previously worked as the research and policy director at Portico Healthnet and as a senior research economist in the Health Economics Program at the Minnesota Department of Health. She holds a master’s degree in public policy from the University of Minnesota and a bachelor’s in women’s studies and political science from Macalester College in St. Paul.